It took me until the fourth classroom covered in frosting stains to realize that it was the last day of classes. Huh. I’m normally not opposed to cake, but today it really didn’t fit my mood. I’m upset and frustrated about the end of Makers, and that raincloud of shame and doubt casts a pretty convincing shadow over everything else. 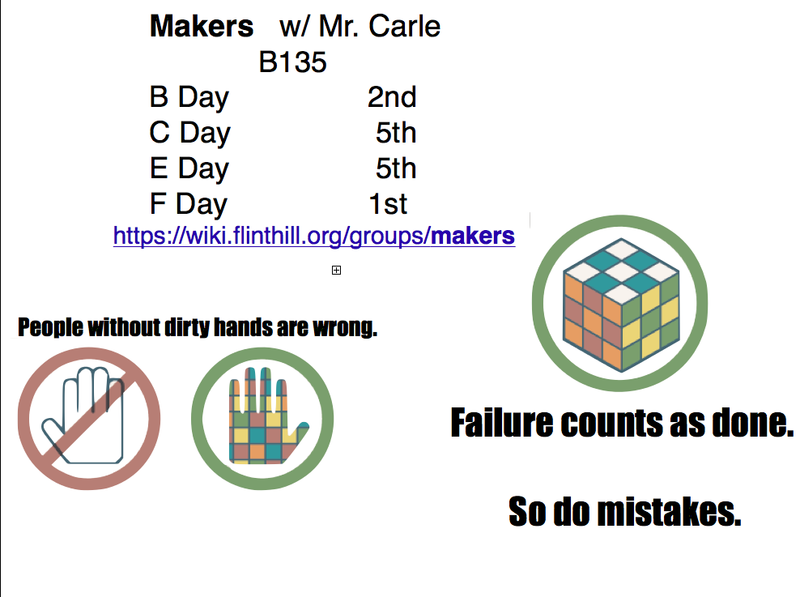 When Makers started, I put a half dozen mini-posters up, mainly so that I would remember when the class met on our wacky schedule. I decorated the sheets with a few highlights from Bre Pettis’ Cult of Done and James Provost’s amazing Rubik art remix poster. I need to own my feeling that, on the whole, the Makers class was a failure. We rolled, literally dismembered, across the finish line with more abandoned projects than active students. Let me be clear – all of those failures are mine, first and foremost. They’re failures of culture, a painful absence composed of several specific omissions and errors along the way. Makers need to draw support and resources from the web. We didn’t. Everyone started on a slightly different project, working from kits or schematics that they kinda understood. During the first few weeks, I didn’t even think about how much damage I was doing every time I directly answered a question. Instead of curating a resource library that fit their reading level and experience, I pointed them to a page of datasheets and forum threads. Even when I tried to show where to find information they needed, the lesson learned was “don’t bother with the complicated stuff. Get the nerd to show you.” Instead of using adafruit/sparkfun/stackexchange as an opportunity for the class to engage with as community of learners, we googled. Worse yet, they googled and then waited for me to interpret the secret knowledge. Makers need to fail quickly and productively. We didn’t. Left without tools to gather their own information, or a consistent knowledge base to build upon, failure became inevitable, tedious and interminable. Fresh from initial success with a MintyBoost, J– assembled a MiniPOV3 in just two class periods. He then lost almost two weeks to a mess of AVRDude/OSX/USB-Serial weirdness. In the end, he had a device that may or may not be soldered correctly, that we were unable to program and unable to test. That failure ate away at the heart of the group, all because J– didn’t have the experience to discern an obstruction from a dead end and I didn’t have the wisdom. Makers need to plan and reflect. We didn’t. This was made incredibly clear as our already irregular class started losing periods to end of the year events. The Xbox motherboard waited for assembly for over a week for want of a 1mm washer … which was hiding at the bottom of the xbox parts bag all along. I’ve always struggled with adding “thou shalt” requirements to a course like this, but without some measure of journaling and planning, 45-minute periods can’t be productive. Makers need to make connections. We didn’t. This one is the most cringe inducing for me. It’s not like we lack opportunities! During the semester, I started visiting two great local hackerspaces; @hacdc and Nova-Labs. We’re within field trip distance of the National Pinball Museum. We’re practically down the block from Thinkgeek of all places! Our community is bursting with people making, dreaming, designing and building. Instead of hitting send or speaking up, instead of reaching out on behalf of kids, the class, the culture, I caved and fell back. Fear. Shame. Insecurity. So many opportunities left fallow over my fear that real nerds will arrive with their righteous judgment .Here’s the counter weight to everything that makes me feel strong, unique and effective as a teacher. Here’s the place where the uniquely broken core of me holds my students back, yanking new opportunities right off their plate. This isn’t the first time I’ve had a crazy ambitious class collapse under me like this. The easiest way to deflect the responsibility, the guilt, is to close the book and write off the central premise as flawed. I can’t do that with Makers. For starters, I’ve got many of these same kids and more signed up for another run next year. If I’m going to build something better, then I have to start by being honest (which, for me, means public) about my mistakes and my failures. As a classroom teacher, I built a whole skillset around how to convince and cajole a bunch of kids slog together through the same marginally dull material at roughly the same pace. Helping students find and pursue their own orthogonal interests is a radically different challenge. That style of teaching requires a radically new skillset and a level of craft that I don’t have yet. I’m hoping that Constructing Modern Knowledge will help me develop and hone those skills, the same way that I developed new ways to identify and support student’s math explorations at Dana Hall. Tomorrow I’ll start planning for the next run, looking for the thousand tiny lessons that might help build and sustain a community of learners in the next class. Tonight, I just need to face the ways I failed a class I loved, and know that the next iteration of Makers will fail in the same places if I don’t remake myself. This is where you are fighting school structure in a lot of ways. If these kids weren’t already broken by the system, you would have had less of an uphill battle with their ownership. That said, I’ve always found the best way to help kids learn that is to overplan, but not tell them. It may seem counterproductive, but think of it like an RPG–they eventually have to fight that boss, but they can try anyway to get there. The options narrow the longer they take (fewer XP point with fights, no new cool equipment to find) so that eventually, they have to deal with the boss to keep going. Write the story you want them to read, but then let them add the adjectives, verbs, and even characters that get there. You are a great motivator, and honestly, that is the part that can’t be taught. You connect with kids and get them thinking about different things. The planning and processing can be improved and learned. And honestly…for a 7th grader? She’ll remember that cool teacher that let her take things about and solder, and was willing to look for information shoulder to shoulder with her. That is a win. I appreciate this public, professional honesty. Since my skill set is currently also built “around how to convince and cajole a bunch of kids slog together through the same marginally dull material at roughly the same pace,” I can’t offer any solutions. However, I’m thinking about creating a space after school next year (a math club? a “puzzle” club?) that would look a little bit like this – with students grabbing problems or projects or tasks that interest them, and flying off in different directions. So I will continue to read and appreciate your insights about how to build a classroom that works this way. Also, if you plan a field trip to the National Pinball Museum, I am SO in. Let me know how puzzle club develops!I’ll be freed form the anchor of 3pm carpool next year, and I want to use that flexibility to check in with more US clubs. Have you ever worked with a group of kids exploring a bunch of different problems that are legitimately perplexing to you? There’s a real unease to that situation, where I know that my glib response has a decent chance to be significantly incorrect, but that my other option is to sit down and immerse myself in the problem. If I can find a way to manage the number of different threads in a given class, I think that will help immensely. And if you like pinball, there’s a hidden treasure trove right on 50 at Jermantown. Pinball lunch sometime after exams? Chin up! Thank you for your reflection! We all learn, moment by moment. I appreciate both your honest reflection and your continual striving for the goal. Thanks Suzanne! I posted from the depths of the pit because I wanted to mark the moment. By the next day I had managed to find a better headspace and perspective. But that’s a good reminder that I should still get through a more detailed post-mortem for this year.